Israeli soldiers have abducted, overnight and at dawn Thursday, 25 Palestinians, in different parts of the occupied West Bank, including Jerusalem, during extensive invasions and violent searches of homes, and property. In Tulkarem, in the northern part of the West Bank, the soldiers abducted Ismael Izzat Jaber, 24, Ramez Abdul-Hakim Oleyyan, 20, Emad Mahmoud Masharqa, 30, from Nour Shams refugee camp, Adel Hani Omar, 22, from Far’un town, in addition to Ahmad al-A’raj, 26, and Bassam Mer’ey, 46, from Thannaba town. In Qalqilia, also in the northern part of the West Bank, the soldiers abducted two young men, identified as Ayyoub Abu Haniyya, Wajeeh Akram Seelat, and Ala’ Mos’ab Radwan. In the northern West Bank governorate of Nablus, the soldiers abducted Ezzat Yameen from Tal Village, south of Nablus city. In Jenin, also in the northern part of the West Bank, the army abducted Islam Ali Azayza. In Bethlehem, the soldiers abducted a lawyer, identified as Hussein Abu Ra’ed, in addition to Khalil Shouka and Ahmad Za’al Sahouri. In Ramallah, the soldiers abducted Yahya Hasan Khatib, from Beit Rima town, and Maher Khatib, from al-Biereh. In Hebron, in the southern part of the West Bank, the soldiers abducted ‘Assem Marwan at-Touri, in addition to two former prisoners, identified as Ahmad Yousef Ekhlayyel, 29, and Issa Ali Awad, 30. 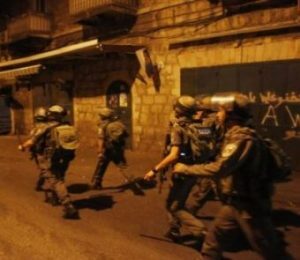 In occupied East Jerusalem, the soldiers abducted four Palestinians; three of them have been identified as Mahmoud Barakat and his brother, Abdul-Aziz, from Beit Hanina, and Maher Khatib, from Kafr Aqab.